There are some kitchen numbers that work so universally well, that you want to have them memorized or written down and on hand at all times. 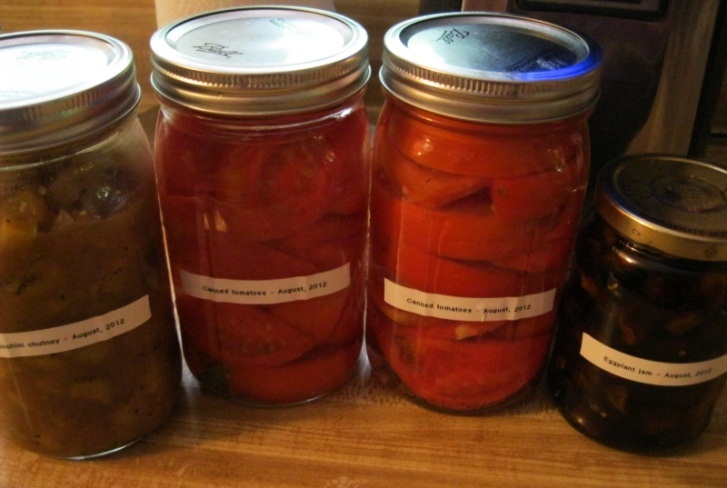 For instance, the pickling solution recipe I use to pickle everything – from tomatoes to zucchini – is 3 cups of water, 2-3/4 cups of vinegar, ¼ cup sea salt, 1 teaspoon of brown sugar. I didn’t even have to look that up, because I’ve used it so much. Sure, I might decide to add something different to the jars as I get ready to close them up: black pepper, dill, caraway seed, garlic, lemon or any number of other things. But the basis is there. The same goes for my pirozhki dough (pirozhki are Russian baked buns, kind of like miniature calzones): 3 glasses of flour, 1 egg, 2 tablespoons of salt, 1 tablespoon of sugar, 3 teaspoons of yeast, 1-1/2 sticks of butter, plus water as the mixing process commences. Bake 30 minutes at 400 degrees F. I have made about a dozen varieties of pirozhki so far, sweet and savory, meaty and vegetarian, with all kinds of stuffings and spices. But once you know how to make the dough – the rest is easy. When it comes to ingredients, knowing the most frequently occurring amounts of certain things not only helps make your cooking process less stressful, but it also helps you plan. 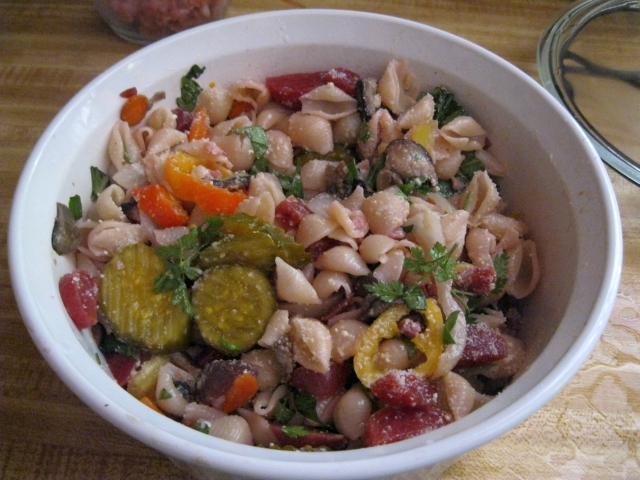 For instance, the small 4-ounce can of Portobello mushrooms is perfect for my pasta salad, or for when I want to toss some with onions and potatoes. So, I just stock up on those little cans whenever I am at my local discount grocery store, and when I am in a hurry, I don’t have to guess how much is enough – I open, drain and dump it in, knowing it’s just right. Besides, the brand I buy is grown and canned locally, so what’s not to love? My herring in a fur coat recipe requires exactly one 16-ounce jar of beets. The White Russian potato salad requires exactly one 16-ounce can of peas and carrots. When cooking rice, water-to-rice ratio is always 2:1 as is the dry rice to cooked rice ratio. Yes, it’s only one ingredient in each recipe – but it’s one less to worry about. I tend to cook multiple things at the same time, very quickly, and even that little bit makes a difference in a whirlwind of various dishes and ingredients (four-course dinner for fifteen people, anyone?). Another set of numbers that gets all kinds of use around my kitchen is 30 – 350. Do you think you can remember that? There is a ton of dishes out there that can be cooked in the oven for 30 minutes at 350 degrees F. Yes, there are other steps involved, but the 30 – 350 step is usually the final one, and getting to that point in your cooking process gives you a kind of, “Hey, check it out! I am almost done and the house is still standing,” feeling. Below are two recipes – one a little more involved than each other – that can be varied by tweaking just a couple of things here and there and conclude gloriously with the 30 – 350 step. 1. Cut chicken breasts into cubes or small strips and cook them in a frying pan on medium heat, using olive oil or butter, until the outsides of each piece are white. 2. Cook the rice – 1 cup dry rice will yield you 2 cups cooked rice. 3. Break up broccoli into smaller pieces, peel and thinly slice the onion and saute them with butter or olive oil on medium-high heat until the onion is just gently golden. 4. Rub a stick of butter on the inside of the casserole dish. 5. Add rice into the casserole dish, add cream-of-mushroom to it and mix thoroughly. 6. On top of rice, spread chicken, broccoli and onion in a layer. 7. Add some salt and pepper to taste. 8. Shred some cheese on top – again, to taste. 9. Bake in the oven for 30 minutes at 350 degrees F.
• Replace chicken with any other meat – pork, beef, ground beef, fish, shrimp, or ham. If you are a vegetarian, add no meat at all. Feel free to use tofu. • Replace cream-of-mushroom soup with any other creamy soup: cream-of-potato, cream-of-chicken, anything you want. • No need to use white rice. Use brown rice. Yellow rice. Long-grain rice. • In addition to broccoli and onion, sauté some carrots and mushrooms. • Cheese can be whatever you want – parmesan, provolone, cheddar, Colby jack, mozzarella. • Mayo lovers, before adding shredded cheese on top of the casserole, mix it with a table spoon of mayo. Note: Start this one well in advance before you have to serve it. You’ll be better off if you prep it early and pop it into the oven, then just turn the oven on 45 minutes before it has to be ready. 2. Slice them into large thick pieces and put into a colander with a bowl under it to juice. Sprinkle some salt – it makes the juice come out faster. (Eggplant juice is very bitter and this helps reduce the bitterness). Let them sit at least 1 hour. 3. Break and whisk an egg in a small bowl. 4. Measure off the breadcrumbs and spread them evenly on a plate. 5. Heat olive oil in a heavy pan on medium heat. Wait for the oil to start sizzling a bit. (Note: you will need to add oil as you keep working, so keep the bottle close at hand). 6. Dip each eggplant slice into the egg, then into breadcrumbs on both sides and place it into the pan. 7. Let fry about 2 minutes per side and use either two forks or kitchen tongs to turn each slice over. A standard large cast-iron pan accommodates about 5-6 slices. 8. Lay out three layers of paper towels and place the cooked eggplant slices onto them to drain off the excess oil. 9. Once all the slices have been fried, pull out the casserole dish and start layering as follows: pasta sauce, eggplant slices, shredded cheese. Depending on the size of your casserole dish and your eggplant slices, you may end up with a one- , two- or even three-layer dish. If you have any breadcrumbs left, sprinkle them on top of the last cheese layer. 10. Bake 30 minutes at 350 degrees F.
11. Let cool 10-15 minutes before serving – eggplant is very meaty and retains heat very well. In that sea of pasta sauce and cheese, it’s going to be lava-hot. • Meat eaters can add browned ground beef to the layers. 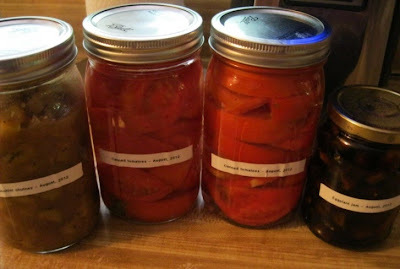 • Pasta sauce can be store-bought or home made. My favorite is mushroom, but you can use anything you want. 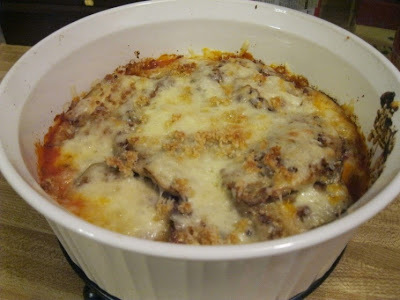 • While it is called Eggplant Parmesan, any cheese works for this dish. Or a mix of cheeses. • If you like things really cheesy, use cheese slices instead of shredded cheese for the cheese layers. • You can sprinkle fresh herbs on each eggplant layer. Try basil, parsley and chives – the fresher the better.